When planning crowd control for an important event, it is important to have some form of identification for the safety of the attendees. 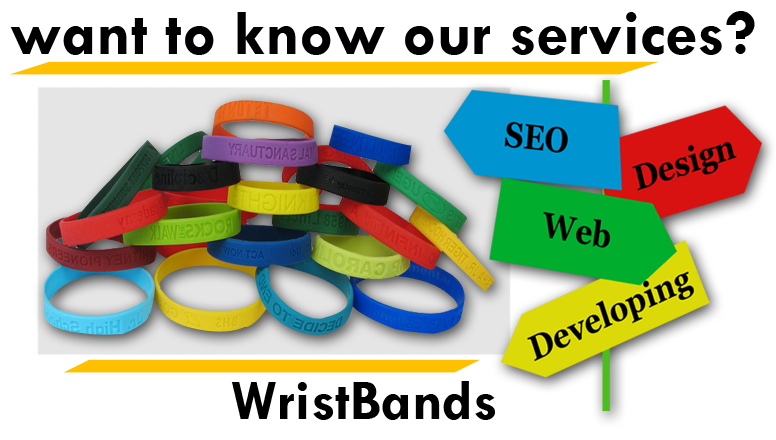 Many event planners choose customizable cloth event wristbands because of their versatility. Fabric wristbands are great because they are durable and waterproof and will not fall off. You can also customize cloth wristbands with personal artwork, messages, and/or designs. Cloth wristbands feature two distinct styles: sublimation (designs imprinted onto the wristband) and woven (designs woven into the wristband). A woven wristband is a perfect way to create a memorable keepsake. Both styles are extremely comfortable, super-durable, and perfect for festivals, concerts, sporting events, or backstage/VIP passes. A fabric wristband also makes a great reminder or collectible for people to remember your event. Both sublimated and woven wristbands are made out of a comfortable cloth fabric. All ready-made cloth wristbands are available with a self-locking closure for one-time use events. Cloth wristbands are for events like fundraisers, concerts, sporting events, and much more. Cloth wristbands are guaranteed to be top-quality. Woven Cloth Wristbands are ideal for small and large-scale orders. Your custom design is woven straight into the band and is a cost-effective option for simple bold graphics. Choose from a wide-range of thread colors. The top of the line option for full-colour bands, custome printed cloth wristbands are ideal for those looking for a highly personalized wristband option. Custom printed cloth wristbands boast a satiny-smooth finish and a printed image that is mirrored on both the front and back sides of the bands for a seamless appearance. cloth wristbands are printed using sublimation processing. Numbered Wristbands are a great way to track your guests at festivals, conferences at other events – all for an additional cost of just 2 cents per band! If you're in a hurry but don't have time to get something custom produced, blank cloth wristbands could be an affordable & fast solution for you. These wristbands come with secure locking closures and are sold in minimum bundles of 100 wristbands. Made from a high-quality polyester material, cloth wristbands are durable, comfortable, waterproof, and stretch-resistant. These express wristbands are made from pre-printed woven cloth material and are perfect for customers who are in a rush and can't get custom cloth printed in time! These wristbands come with secure locking closures, and are sold in minimum in bundles of 100 wristbands. Available in 6 colours/styles: ticket Zone blue, ticket Zone red, ticket Zone green, ticket Zone black, GA and VIP. Made from high-quality polyester material, woven cloth wristbands are durable, comfortable, waterproof, and stretch-resistant. Woven cloth wristbands are commonly used for: Outdoor festivals, Sports events, Multi-day conferences, experiential events. These event wristbands are perfect for both indoor and outdoor use and can be worn for 5+ days. Custom RFID cloth wristbands offer a stylish and secure admission solution for your next event. RFID wristbands are ideal for large events where shaving off a few seconds at the admissions gate per person is worth the extra cost. Classic festival wristband available in woven or printed with barrel lock. The new, non-twist Barrel lock works with any of the woven fabric wristbands. It features a one-way sliding lock that uses prongs to pierce the fabric, preventing the wristband from being removed. The Barrel lock wrist band and other fabric wristbands have additional security features available including barcoding, serialisation and UV weaves. Pre-Designed and plain fabric wristbands are now available. Comes with Barrel Lock fitted as standard. The new, non-twist Barrel lock works with any of our fabric wristbands. It features a one-way sliding lock that uses prongs to pierce the fabric, preventing the wristband from being removed. The Barrel lock wrist band and our other fabric wristbands have additional security features available including barcoding, serialisation and UV weaves. Classic festival wristband, printed on satin or woven. Fitted with metal ring lock. These fabric wristbands use a crimped aluminium ring to grip the fabric and prevent the wristband from being removed. 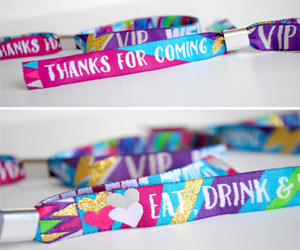 Often known as festival wristbands, they are popular with events of all types and can be custom designed with up to 8 different colour weaves. The metal ring ID wristbands are ideal for any event with a large crowd and require a crimping tool to secure. Classic festival wristband, printed ribbon or woven. Fitted with loop lock. Loop lock wristbands feature a plastic self-closing clip, that is easy to apply and very difficult to remove. Like our other wristbands for events, these wristbands offer high security features including serialisation and woven barcodes. Classic festival wristband, printed ribbon or woven. Fitted with Smartlock® Custom fabric wristbands are popular with festivals and when used with our patented Smartlock® they become the most secure woven wristbands available. The Smartlock® can't be replicated and applying additional security features ensures a 100% non transferable wristband. Variable woven wristbands offer an extra layer of security and give event organizers greater accuracy over admission control. They can also be used as a clever paper ticket alternative. Bar-coded wristbands offer an extra layer of security and give event organizers greater accuracy over their admission control. Using a custom designed plastic tag, it's able to apply any barcode or QR code to a fabric event wristband. •	Increased control and security •	Works with any barcode or QR code •	Full color custom branding on tag. Ready-made cloth wristbands can ship on the same business day! Cloth Wristbands are perfect and secure any event. They are comfortable for multi-day events, super durable and perfect for festivals, concerts, sporting events, backstage/VIP passes, marketing and make for great souvenirs or collectibles.